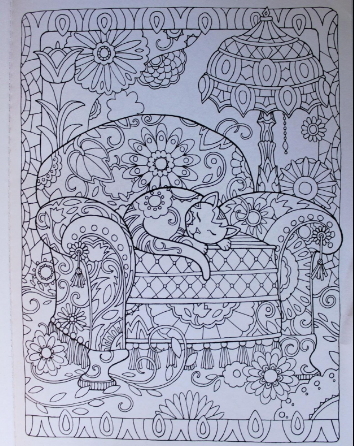 Here kitty, kitty... let me color you! 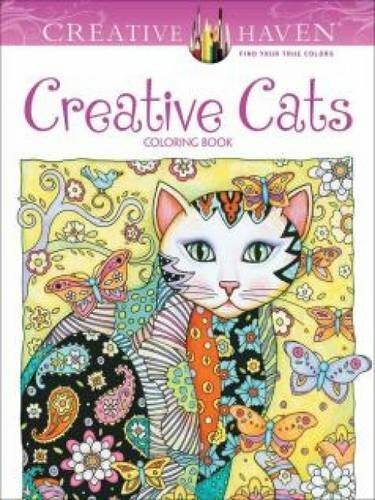 Creative Haven has come out with their contribution to colorists who love cats. 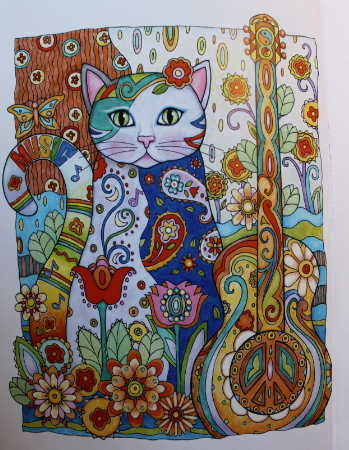 Creative Cats is another well-done coloring book for grownups, if perhaps not quite as "creative" as other books from this publisher. To be fair, the book is well made and there are many wonderful illustrations. The scenes are delightful. My only complaint is that the cat faces are essentially the same throughout the drawings. As a cat lover who thinks of each one being distinct and having unique personalities, that was disappointing. 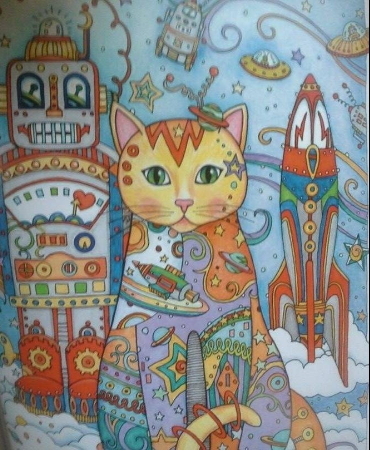 But otherwise it is a very nice coloring book with a lot of variety in the themed background scenes. The 31 full-page illustrations are printed as one-sided pages with good quality, thick paper. Some markers may still bleed through, but since the pages are perforated, it is anyway best to remove them before coloring so that you have a flat working surface, as well as preventing any mishap to underlying drawings. (You can also put a backing sheet behind your work in progress if you want to leave the book intact.) Primsacolor colored pencils work well on this paper without any worries about ink bleed-through. Left-handed folks usually appreciate the perforations as well, as the binding can't give you any trouble when the pages are removed. In this case the binding actually "breaks" to lie quite flat, so it's easy to color on, and you can make good copies of the pages that way, without extracting individual pages. 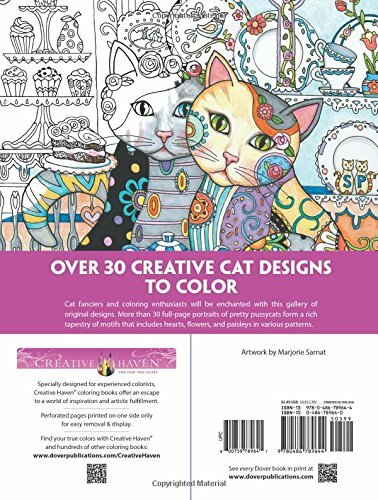 The illustrations are in the typical Creative Haven style with well-drawn whimsical scenes, moderately intricate designs and backgrounds, and thoughtful themes for each page. They evoke topics like flowers, rocket ships, fairies, travel, music, etc. I really like how the designs used to fill the scenes mostly fit the theme, rather than just using abstract geometry. 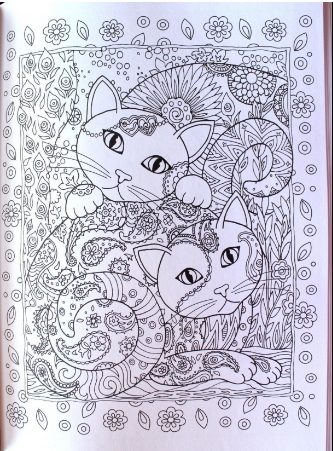 The approach is all about fun (too bad those kitty faces look like they are in a trance) and the images look great when filled with bright colors, glitter pens and metallic pencils. So take a look at the sample pages and if you see the potential, get yourself a copy and be prepared for hours of relaxing enjoyment.